Las Vegas, NV (USA) – The baddest man on the planet, UFC® heavyweight champion Brock Lesnar, is back in the main event for UFC 121, and unbeaten Cain Velasquez is looking to take his belt and become the first man to knock him out. Lesnar proved he had beaten the severe illness that kept him sidelined for a year by withstanding the onslaught by Shane Carwin at UFC 116 and defending his heavyweight title with a slick submission in the second round. His opponent at the Honda Center in Anaheim, California, on October 23, 2010, Cain Velasquez, has already made short work out of the heavyweight division and he promises to make the most of his first shot at the title. Also on this star-studded UFC 121 card, which is presented by Boost mobile, welterweight star Jake Shields makes his long-awaited UFC debut against perennial contender Martin “The Hitman” Kampmann. Also featured is an exciting welterweight matchup as Diego Sanchez battles Paulo Thiago, while it is teacher vs. student as Matt “The Hammer” Hamill takes on his coach from The Ultimate Fighter®, former UFC light heavyweight champion Tito Ortiz. Rounding out the main card is a bout pitting rising heavyweight star Brendan Schaub against veteran contender Gabriel Gonzaga. Tickets for UFC 121 will go on sale Saturday, August 21 at noon PT and will be priced at $500, $400, $300, $200, $125 and $75. Tickets are available at HondaCenter.com, Ticketmaster.com, charge-by-phone (800.745.3000) and all Ticketmaster retail locations. In addition, any remaining tickets will be available at the Honda Center Box Office beginning Monday, August 23 at 10:00 AM. UFC® Fight Club™ members will have the opportunity to purchase tickets to this event Thursday, August 19 starting at 10am PT via UFCFightClub.com. A special internet ticket pre-sale will be available to UFC newsletter subscribers on Friday, August 20 starting at 10am PT. To access this presale, users must register for the UFC newsletter through UFC.com. UFC 121 will be available live on Pay-Per-View on iN DEMAND, DIRECTV, DISH Network, TVN, BellTV, Shaw Communications, Sasktel, and Viewer’s Choice Canada for a suggested retail price of $44.99 US/$49.99 CAN for standard definition or high-definition broadcasts (where available). 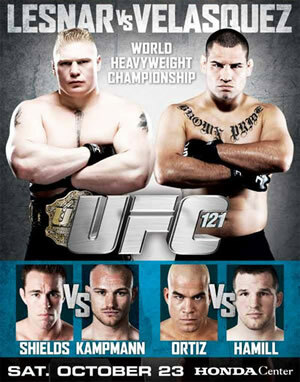 UFC 121 will also be available on Pay-Per-View in Spanish in the United States. At UFC 121, Brock Lesnar (fighting out of Minneapolis-St. Paul, Minn./5-1) will be making his third title defense and, if successful, will tie Tim Sylvia for the most heavyweight title defenses. Lesnar will also set the record for most consecutive successful title defenses in the division. The four-time All-American wrestler at the University of Minnesota also won two Big Ten championships, as well as a National championship in the heavyweight division. The native of South Dakota showed his evolution as a fighter during UFC 116, as he was able to submit Shane Carwin with an arm triangle choke. A polarizing figure, Lesnar perhaps gained a stronger following from the courage and drive he displayed to overcome his bout with diverticulitis in 2009, and the best heavyweight on the planet has used his new lease on life to motivate him even further. At 8-0 as a pro, Cain Velasquez (fighting out of San Jose, Calif./8-0) is the 20th fighter to fight for a UFC title with less than 10 professional fights. Of the 19 previous fighters, only four were successful in winning the title and interestingly, all were heavyweight fighters. Much like Lesnar, Velasquez was an outstanding collegiate wrestler, as he was a two-time All-American at Arizona State University. His speed and power may be the keys to a victory over Lesnar, as Velasquez has been very successful in using his athleticism to beat bigger foes throughout his career. After establishing an impressive international reputation, Jake Shields (fighting out of San Francisco, Calif./25-4-1) has made the transition to the Octagon to test his skills against the best fighters in the world. Shields’ resume is an impressive one, as he has been successful in defeating Carlos Condit, Mike Pyle, Robbie Lawler and former PRIDE champion and UFC veteran Dan Henderson. Shields’ signing has been highly anticipated by the MMA community and his first fight will be a true test to where he stands in the welterweight division. An established fighter with the UFC, Martin Kampmann (fighting out of Las Vegas, Nev./17-3) is riding a two fight win streak, and has also won four of his last five. Overall in the UFC, “The Hitman” has compiled a record of 8-2, dating back to August of 2006. The Denmark native has tremendous knockout power and an underrated ground game, which could prove to be a tough combination for Shields. Diego Sanchez (fighting out of Albuquerque, N.M./23-4) made his UFC debut on the first season of The Ultimate Fighter, defeating Kenny Florian to win a contract with the organization. The “Nightmare” was successful in the welterweight division, but chose to move to lightweight where he fought for the championship against BJ Penn. Sanchez has since moved back to the welterweight division, as well as back to Greg Jackson’s camp, where he hasn’t trained since he fought Josh Koscheck in 2007. Special ops police officer Paulo Thiago (fighting out of Brasilia, Brazil/13-2) made a splash in the welterweight division in 2009 when he defeated Josh Koscheck via first round knockout. Thiago has only five UFC fights in his career, however he has proved to be a tough opponent with an iron chin. The submission specialist will be a formidable opponent for Sanchez, in a matchup that will help two fighters realize their position within the welterweight division. One of the most recognizable figures in the MMA community, Tito Ortiz (fighting out of Huntington Beach, Calif./16-7-1) is at an interesting place in his storied career. The “Huntington Beach Bad Boy” will be taking on his pupil from the third season of The Ultimate Fighter, Matt Hamill, and while Ortiz has dealt with some recent adversity due to injuries, the former world champion is healthy and firing on all cylinders in his quest to beat “The Hammer” and get his title back. Matt Hamill (fighting out of Utica, N.Y. by way of Loveland, Ohio/10-2) has been flying under the radar recently, quietly putting together a four fight win streak. Impressive victories over Mark Munoz and Keith Jardine, coupled with a DQ victory over Jon Jones, have elevated Hamill to the upper echelon of the light heavyweight division. His status as a three-time Division III NCAA wrestling champion, as well as a two time world champion in freestyle wrestling, has helped “The Hammer” avoid 90% of total takedowns, as he continues to develop his standup technique. Making his debut at The Ultimate Fighter 10 finale, Brendan Schaub (fighting out of Denver, Colo./7-1) has been victorious in his last two fights, most recently at UFC 116 when he defeated Chris Tuchscherer via first round knockout. A former Golden Gloves champion, “The Hybrid” has obtained a purple belt in Brazilian jiu-jitsu, which will help elevate his status in the heavyweight division. Another fighter who is at a crossroads in his career is Gabriel Gonzaga (fighting out of Ludlow, Mass./11-5). Coming off tough battles with two of the division’s best in Junior Dos Santos and Shane Carwin, Gonzaga has seven wins in the UFC and has not been shy to fight top competition, as he has also fought Mirko Cro Cop, Fabricio Werdum and Randy Couture.